Today I have been a poorly girl. After scaring the bejesus out of my poor husband at 6am by falling flat on my face (smooth as ever), I have been informed to 'rest'. This is not a concept I am used to. So, I have spent most of my day nursing a headache and watching daytime telly. One of the things I managed to do was have a proper read of Living in BL, a fantastic new publication for those of us who live in Bolton West and the surrounding area. It's been set up by local people, Denise and Vic Silcock and covers interesting events in our area, and supports local businesses. There's a particularly nice piece in there on one of my favourite venues, Thyme Deli by one of my favourite folk... Mrs Petticoat! Have a read! 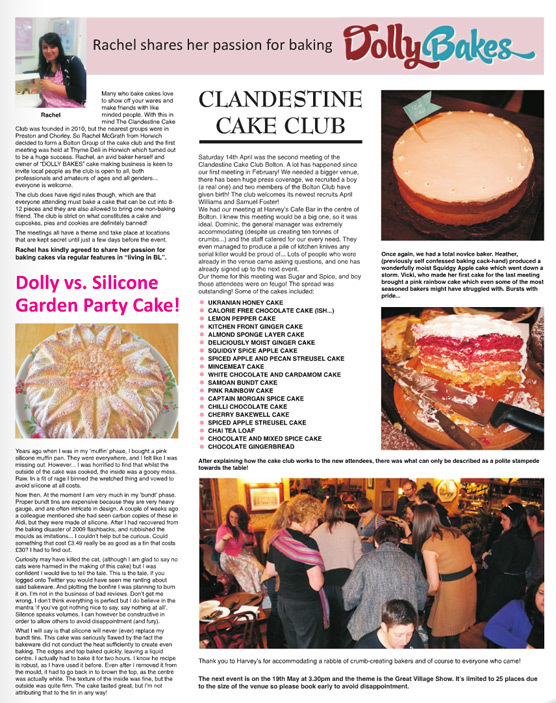 They were kind enough to give me my own column in their first issue, which gave me a fit of the giddy kippers! The next edition is out on 18th May and can be picked up from their offices at 147a Chorley New Road, Horwich (near Wrights') or Thyme Deli on Winter Hey Lane. I'm sure it'll be available at more locations soon, but in the meantime you can read it online here. Contact Living in BL on 01204 669966 or on Twitter @LivinginBL.